This project in progress continues my exploration of the way in which modern technology and machinery are often seen as disruptive of ‘nature’ as a retreat from the urban environment. Obvious examples that attract ‘our’ disapproval are structures such as pylons, cell phone masts and wind turbines. These (from one perspective at least) tend to be regarded as a blight when found in otherwise ‘untainted’ countryside. The structures in this series are associated with detection. The radars and telescopes in the work look out from their rural location. The notion of an escape to the countryside is always at odds with a desire to maintain some distance, to objectify and see the non-urban from a subjective vantage point. As landscapes, these images offer some resistance to this kind of mastery. On the one hand, they gaze out with authority to places beyond our human eye capability. On the other, they collapse into a trope of Picturesque charm. Technology is only disruptive of idealised ‘nature’ when its associations are with contemporary life. Technology with a patina of age has the potential to be absorbed into the bucolic. 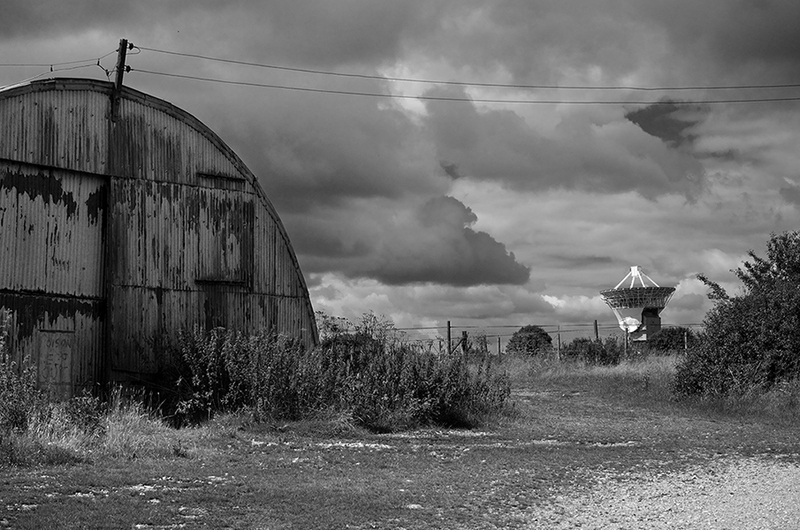 Even in the case of the functioning radars and radio telescopes, in their countryside setting they begin to remind us of a certain sub-genre of British science fiction; and as such they too begin to invite a nostalgic desire for the past. In a way, these images represent a tussle between our desire to maintain our ocular advantage (and see the landscape in a way that serves our needs) and our preparedness to give ground and relinquish our Self-affirming vantage point.